Hamilton is a Swiss-made brand with historical American-roots. The brand has history as a provider of watches for divers in the United States Navy, and released a professional-grade diving timepiece known as the Khaki Navy Frogman at Baselworld 2016. The name is taken from the first time Hamilton watches appeared onscreen in the 1951 film The Frogmen. This year, Hamilton has announced the release of a sleek, sporty and colorful successor to last year’s Khaki Navy Frogman watch: the Khaki Navy Scuba. The Hamilton Khaki Navy Scuba is more streamlined than its predecessor and has less of an industrial military appearance. For this new timepiece, Hamilton has removed the Frogman’s bulky crown- protection device and helium escape valve. The case has been scaled down to a wearable 40mm composed of durable stainless steel. The Khaki Navy Scuba features water resistance up to 100 meter, making it ideal for more casual divers and swimmers. 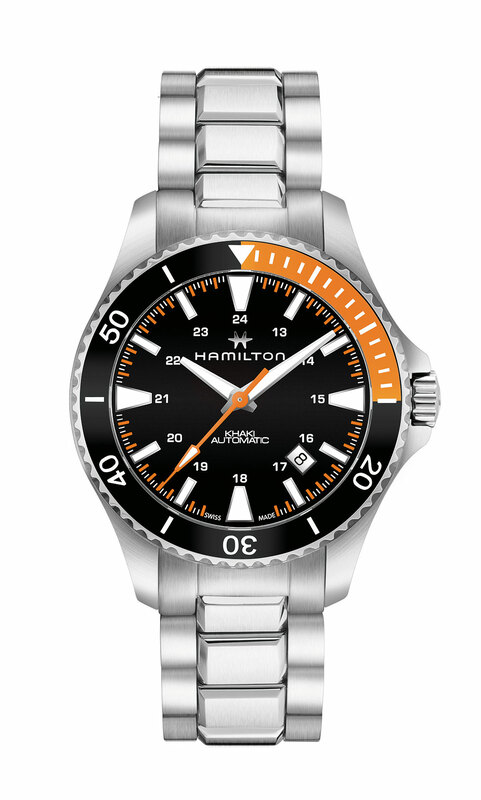 The Hamilton Khaki Navy Scuba retains similar elements to the Frogman, including the black dial, luminescent triangular hour markers, screw-down crown, and unidirectional rotating bezel. It is available in black with an orange-highlighted section for the first 15 minutes of dive time. The timepiece also features matching orange accents on the dial on the central seconds hand and minute track. The date appears in a window between 4 and 5 o’clock. This timepiece is powered by the Caliber H-10 self-winding automatic movement, the same that powers the Frogman, which has an impressive 80-hour power reserve. 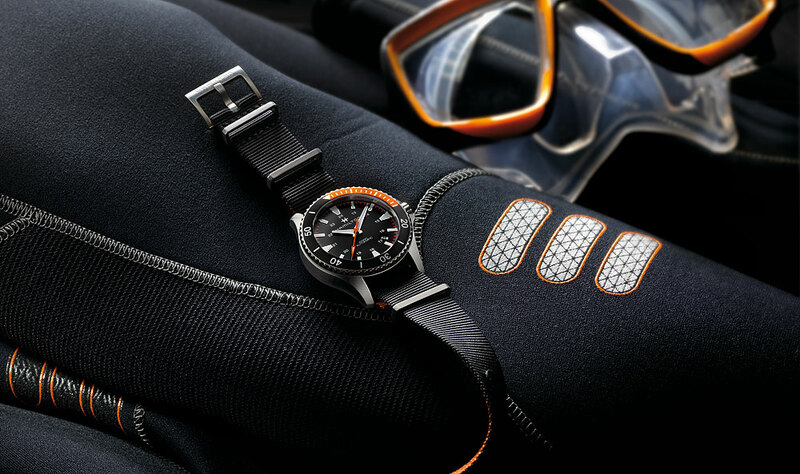 The Hamilton Khaki Navy Scuba comes on either a textile NATO strap with a black exterior with orange lining, or on a stainless steel bracelet with an adjustable deployment clasp. Whether you are looking for a diving watch or just an accessible, sporty timepiece, Hamilton offers a variety of sporty and stylish options with the new Khaki Navy Scuba models. 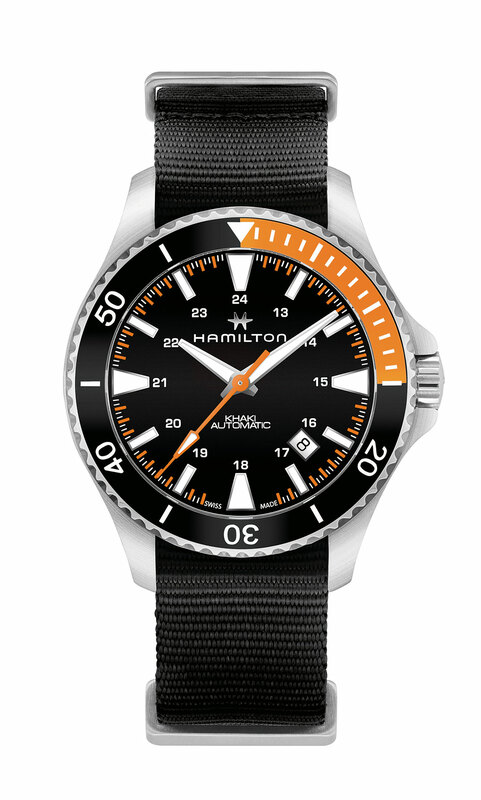 Contact AuthenticWatches.com to inquire about preordering one of these Hamilton Khaki Navy Scuba models today! This entry was posted in Brand Name Watches and tagged affordable watches, authentic watches, authenticwatches, discounts, diving watch, free shipping, frogman, Hamilton, hamilton khaki, hamilton khaki navy scuba, hamilton watches, luxury watches, new releases, new watches, Swiss watches, timepiece, timepieces, watch, watch discount, watch discounts, watches. Bookmark the permalink.